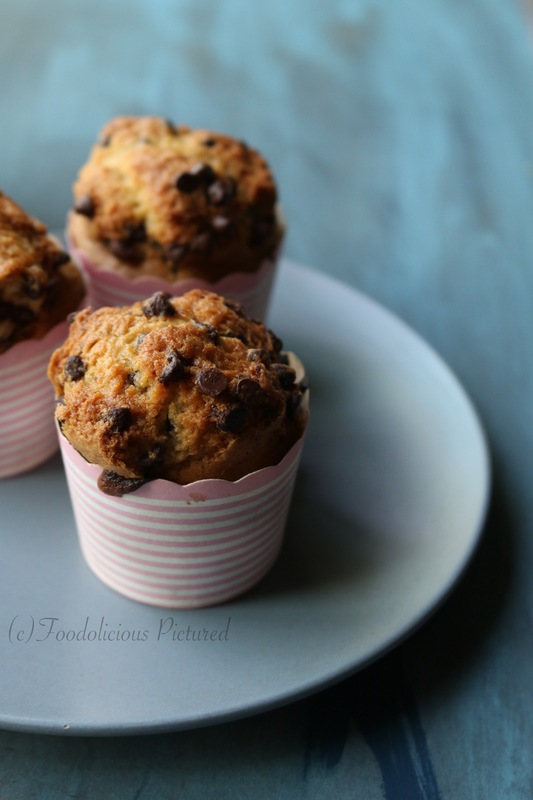 There are chocolate-chip muffins, and then there are muffins with an overload of chocolate chips. If my daughter has her way, she will always choose the latter – more chocolate the merrier. And as a doting mother, I do give in for her indulgence at times; what an excuse bake! The secret of getting the muffins baked to perfection is to start at high temperature for a few minutes, reduce the oven temperature and then bake till done. And you have this wonderfully moist, gooey, oh-so chocolaty muffins! Start by Pre-heating the oven to 220°C. 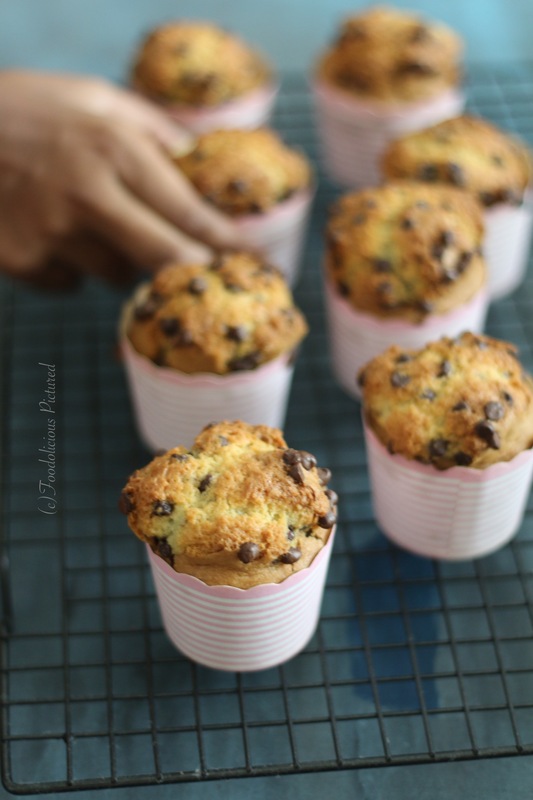 Line the muffin tins with paper muffin cups or grease muffin tins. In a bowl sift the flour, baking powder, baking soda, Salt and set aside. In a mixing bowl beat the sugar and butter until well combined. Beat in the eggs one at a time and stir in the vanilla extract. Turn the mixer speed to low and gradually add the flour alternating with milk. 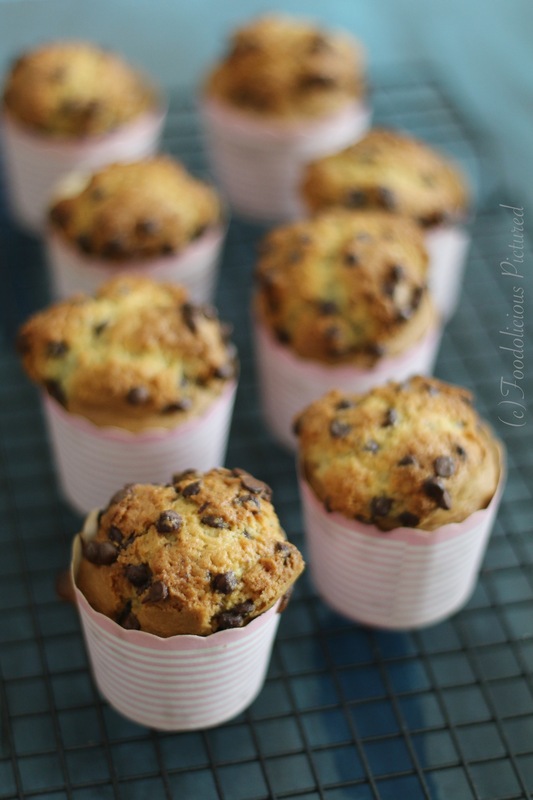 Fold in 2 cups choco-chips. Mix gently till everything is well combined. Make sure not to over mix the batter else the muffins will not be light and fluffy when you bake. Spoon the batter into the greased muffin tins or muffin cases. 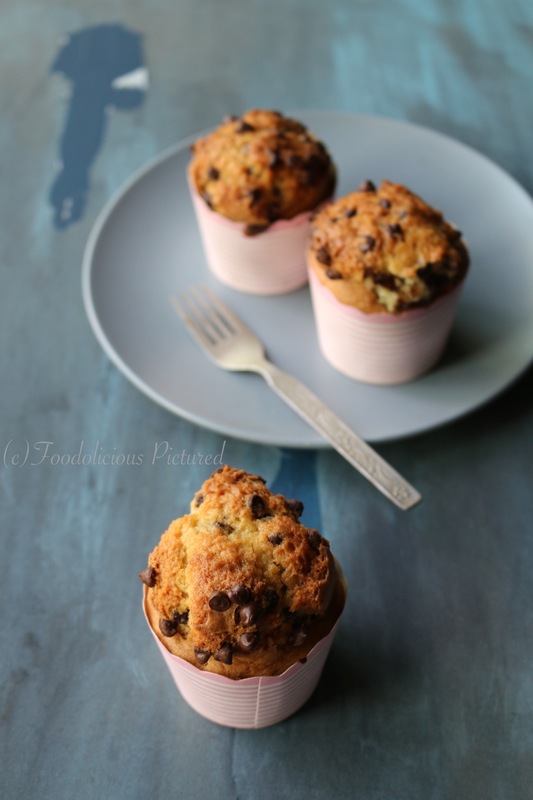 Sprinkle the remaining ¼ cup of Choco chips and bake for 5 mins at 220°C and then reduce the oven temperature to 175°C and bake for another 15-20 minutes or till a toothpick comes out clean when inserted in the middle of the muffin. Turn onto a wire rack to cool. Serve warm! My my these look delicious!! One cannot have too many dark chocolate chips! These cakes are calling my name.This just made me crave a bite of this cake!! Looks so yummy..